The Academy Award-winning Rocky starring a young, buff, Sylvester Stallone premiered more than 40 years ago (1976). There have been seven sequels since, bringing us to CREED II. Having not seen all of them (sorry to say), we (Stewart Stewart and I, Dena Stewart) needed to catch up and fill in the gaps. In the original Rocky, Rocky Balboa, a simple, good-natured Boxer-wannabe gets a shot at the world Heavyweight championship and fights Heavyweight Champion Apollo Creed (Carl Weathers). Rocky wins. The backstory involves his life in the slums of Philadelphia and his growing love, support, and marriage to Adrian (Talia Shire). In the follow-up sequels, Rocky loses his championship title, wins it back, loses again, then watches helplessly as Apollo Creed is killed in the ring by Russian Heavyweight Boxer Ivan Drago (Dolph Lundgren). Rocky seeks revenge and fights Ivan Drago. Rocky wins. Fast forward to CREED I. Adonis “Donnie” Johnson (Michael B. Jordan), the son of an extramarital lover of Apollo Creed, is serving time in a Los Angeles youth detention center. Creed’s widow, Mary Anne (Phylicia Rashad), takes him in. Years later, Donnie resigns his job in Finance to pursue his dream of becoming a professional Boxer, like his father. He travels to Philadelphia and meets Rocky who becomes his trainer. He also meets Bianca (Tessa Thompson), a hard-of-hearing singer and songwriter. Donnie defeats a local fighter, and word gets out that he is Apollo Creed‘s illegitimate son. In the backstory, Adrian dies, Rocky and his son become estranged, and Rocky fights a bout with cancer. In the meantime, Donnie changes his name to Adonis Creed, fights “Pretty” Ricky Conlan, and establishes himself in the Light Heavyweight division. This brings us to CREED II. Adonis Creed is challenged to fight Viktor Drago, the son of Ivan Drago, the Russian Boxer who killed his father. CREED II focuses mostly on Adonis Creed’s grueling preparation for the fight, with the backstory about his changing personal life. He and Bianca are about to have a baby. As with Rocky and all the Rocky sequels, it’s clear who to cheer for and who to boo. In CREED II, we cheered for the buff Adonis Creed and booed his over-buff Russian opponent Viktor Drago. We booed Ivan Drago who goaded his son to fight his battle. And we cheered for the older, lonely, Rocky Balboa who, through his own personal tribulations, has become a thoughtful, very wise man who gives his support to Adonis as they confront their shared legacy and together learn what’s important in life. 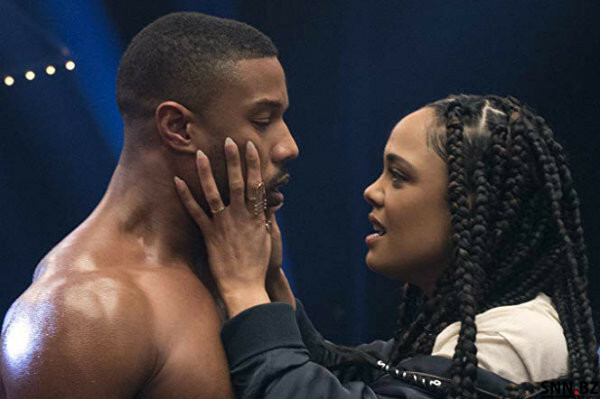 Although CREED II was predictable, Sylvester Stallone is and will always be the lovable underdog who narrowly wins in a big way, and Michael B. Jordan is the ideal protege to be his student. With gorgeous Tessa Thompson as Adonis Creed’s “Adrian” the parallels make CREED II another energizing Rocky movie sequel.